I'm flying to Orlando for the NMA reunion, and will need ground transportation to the Doubletree. The hotel does not have its own shuttle, but as a major resort, there's no shortage of transportation options. Because I turn into a quivering puddle of warm Jell-O at the thought of travel glitches, I've done the research. The Doubletree Universal staff recommends Mears Transportation. Their shuttles in Orlando run to hotels and tourist attractions around the clock. The Mears desk at Orlando International Airport is on Level 1 (near the car rental counters). There, you'll pay, get your ticket and be told where to wait for your shuttle. One-way transportation is $19, and round-trip is $30. They'll try to group travellers with geographically similar destinations together. Most trips take a half-hour to an hour. The Mears desk closes at midnight. If you arrive later, call them, and they'll tell you where to get a shuttle. You'll need cash to pay the driver, though. You can make advance reservations online at the Mears Transportation website. While it's not necessary, it can be an advantage. My flight arrives in Orlando at about 8:30 p.m. in the evening, and,being a professional worrier, I consider the chance that my plane will be delayed over the Arctic Circle and arrive at the airport after midnight. Having made my reservation already, I got a trip voucher by e-mail. I can scan it at the desk and it will print out my ticket. Mears provides other options. Visting royalty, heads of state and retired master chiefs may wish to hire a stretch limosine. For the common folk, they've got a fleet of taxis and other vehicles, which might be an option for a group travelling together. Advance booking is not required, but can be done online or by phone. Round trip is cheaper. If you arrive after midnight, give Mears a call. Frank Mullen is in no way associated with Mears Transportation and receives no remuneration or material benefit from promoting their services. He provides this information only because he loves you and wants your life to be better. Frank Mullen provides the best information available and takes no responsibilty for any damn thing that might go wrong. Still fresh after a year. Artist, photographer and NMA saxophonist creates attractive plaques on media such as aluminum or canvas. 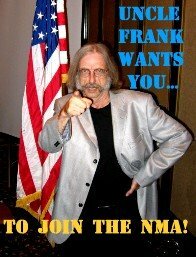 He's now offering Navy Musicians Association members plaques with the NMA emblem and personal information. This one--I've seen it, and it's remarkable--is the NMA emblem on a 9.5" x 9.5" square of aluminum, backed with a 12" x12" steel mount. Under the anchor is room for name, rank and Navy status. Plaques are also available in red (below). Either color can also be printed on 11" x 11" canvas stretched on a wooden frame. Remarkably, both versions, the aluminum and canvas, are created by a process that involves inkjet printing and special coating. The metal plaques are $89, the canvas $69. Contact John for more information.